Participants posed for a group photo. The WaKAmono are a diverse group — different ages, different backgrounds, different professions. What they have in common is that when they were in college, they spent a year or more in Japan as students of the International Division or Kokusai Gakubu (Kokusaibu for short) at Waseda University in Tokyo. The program, established in the 1960s, enabled mostly American students, many of them from the California State University system or California private colleges, to study Japanese language and culture while living with Japanese host families. The grades and units the students earned were transferred back to their home campuses. 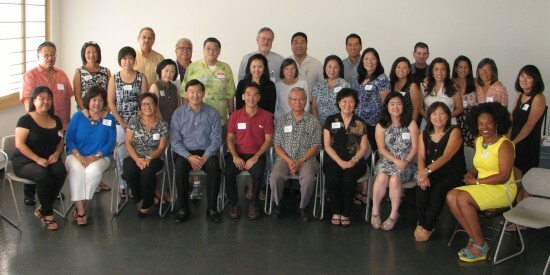 A gathering of about 35 WaKAmono was held on Oct. 10 at the Japanese American Cultural and Community Center in Little Tokyo. 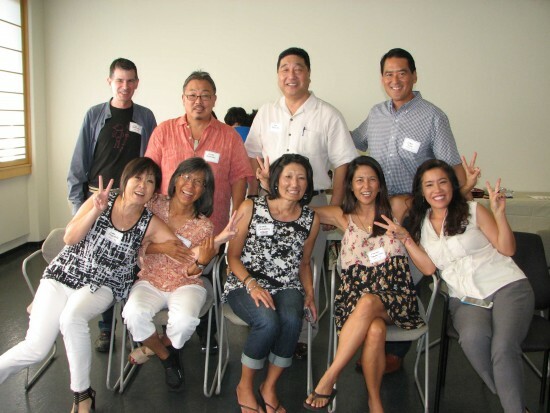 The nickname is a play on words — “wakamono” means “youth” and “WaKA” stands for “Waseda Kokusaibu alumni.” The event was organized by people active in the Japanese American community but was open to anyone who went through the program. 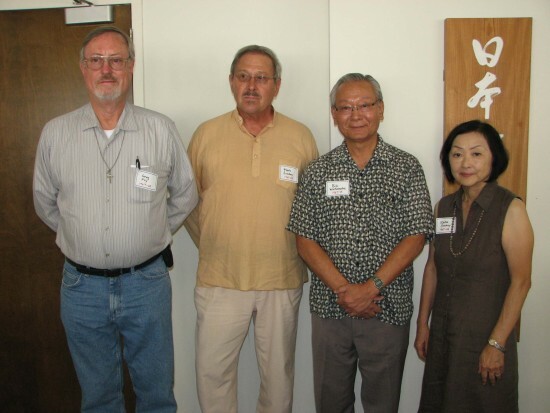 Bill Watanabe and Michael Okamura work together as leaders of the Little Tokyo Historical Society and found out that they both were at the Kokusaibu in 1967-68 and 1984-85, respectively. “It turns out that every now and then we bump into people, we chat, and we find out that they went to Waseda … We thought maybe if we could pull together a gathering of people who shared that same experience it might be kind of fun, even though we all might have gone different times,” Watanabe said. 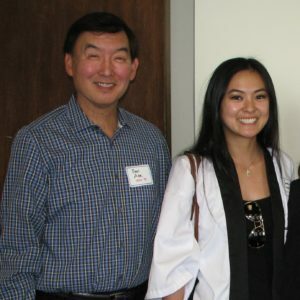 Paul Abe (1974-75), an event committee member, and Camryn Sugita (2011-12), a member of the Nisei Week Court and the youngest attendee. 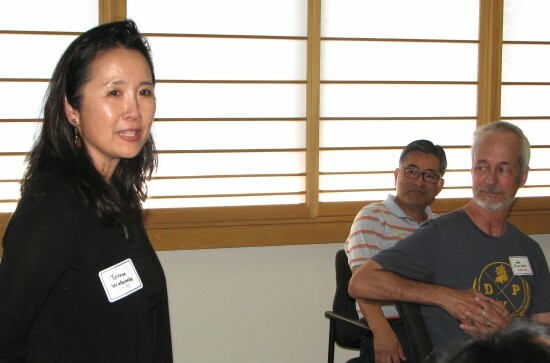 Amy Kato (1975-76), formerly of Visual Communications, noted that attendees came from as far away as San Diego, Santa Barbara and San Francisco, and were at Waseda as long ago as 1967 and as recently as 2011, with the 1982-83 alumni as the biggest group. 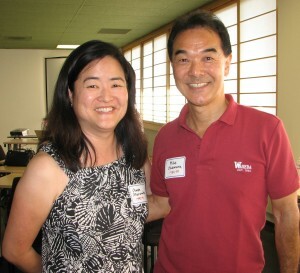 Event organizers included Gwen Muranaka (1990-91) and Mike Okamura (1984-85). Kaji, who also attended Sophia University in Tokyo, later became a member of the President’s Export Council under President George H.W. Bush, director of the California Office of Trade and Investment, a member of the American Chamber of Commerce in Japan, and a member of the Japanese American National Museum’s Board of Governors, among other posts. The 1982-83 contingent: (Back row, from left) Jim Gottlieb, Scott Konishi, Ken Nishida, John Iino. (Front row, from left) Judy Miyashita, Yuki Okada Woo, Jennie Shikashio, Marlene Yamane-Chan, Emile Yanagi. Although she found “it wasn’t feasible for a woman to be in management, especially a Nikkei woman” at the time, she later became vice president of commercial banking at Union Bank and Chemical Bank and now has her own management consulting business. 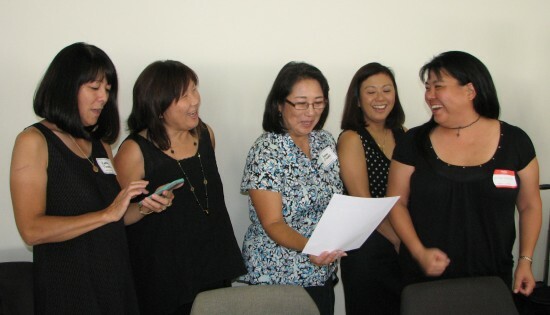 From left: Kathy Tanaka (1976-77), Diana Ono (1976-77), Susan Oiwake (1978-79), Frances Matsumoto (1979-80) and Mika Matsui (1994-95) sing the Waseda fight song. Paul Abe (1974-75) from USC did not have a typical Sansei background. “I was born and raised in New York, so I didn’t have much exposure to Japanese culture or Japanese language, so I thought this was a great opportunity … I was an architecture major but I enjoyed Japanese language, Japanese culture … I wanted to go into a field where I could use Japanese language and be part of the Japanese community. Camryn Sugita (2011-12) was by far the youngest attendee. “I went from American University in Washington, D.C. and I studied at Waseda because I was actually born just outside Tokyo, so I wanted to go back and learn about where I came from specifically … I now work at the Japanese American National Museum … I’m also part of this year’s Nisei Week Court as well.” She was about to leave for Japan as part of the Nisei Week delegation. Teresa Watanabe (1977-78) introduces herself as Jon Kaji (1974-75), a member of the event committee, and Joe Parker (1975-76) listen. 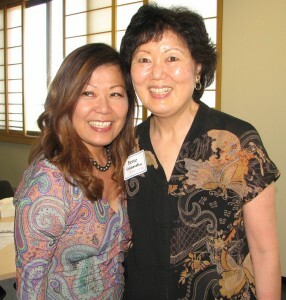 Arlene Yee (1975-76) from USC wanted to apply for the program ever since she heard about the Kokusaibu from her sister’s best friend. “Originally, I thought I would be going into some kind of interpreting or some kind embassy work … but I think I realized once I was there that my Japanese was never going to be good enough to do that,” she recalled. Instead, she went into social work. “A group of us who are in mental health and Asian started … the Asian American Christian Counseling Service, and we’re celebrating our 30th anniversary next year,” she said, noting that the group offers counseling in such languages as Japanese, Mandarin, Cantonese, and Korean in Los Angeles and Orange counties. Teresa Watanabe (1977-78) is a Seattle native who was attending University of Washington and applied for the program as an independent student. 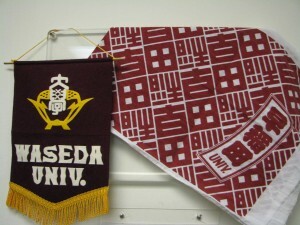 She reflected, “My year at Waseda completely changed the trajectory of my life … While I was there I met all these Trojans who told me that I should really transfer to USC, which I did. So I went to USC, majored in journalism and in East Asian languages and culture, and that solidified my career goal, which was to be a Tokyo correspondent. The 1967-68 contingent (from left): Greg Fry, Mark Sonday, Bill Watanabe (event committee member), Reiko Sonday. She did gain a husband, though not a Japanese one, as well as a second family that she is still in touch with today. “In fact, I’m going to visit the mother at the end of this month,” she said. 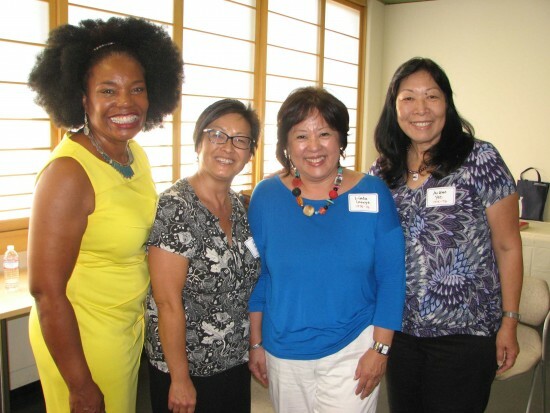 The 1975-76 contingent (from left): Gael Pullen, Amy Kato (event committee member), Linda Inouye, Arlene Yee. Nanci Nishimura and Bette Hiramatsu, both 1974-75. In addition to lifelong friends she made at Waseda, Tanaka is still in touch with her host family from a six-week visit to Japan on a Lions program. Left: Mike Okamoto is a 1974 graduate of Waseda and a member of the university’s alumni association. Right: Fred Fujioka (1970-71) is now a Los Angeles County Superior Court judge. She worked for the publisher Kodansha and Citibank in Japan and with Nisei Week and the Japanese American Credit Union since coming back. She is also a real estate agent. Francis Shima Matsumoto (1979-80) from Pitzer College said that as a result of her experience at Waseda, she took her children on a trip to Japan and encouraged them to learn more about it. One of her children went to the Tohoku area to help out after the 2011 tsunami, another went to Japan through a sister-city program, and the third went through the Tomodachi program. Dave Matsukawa (1976-77) from CSU Dominguez Hills learned a lot about Japan from his Nisei father, who served in the U.S. occupation of Japan, and his Issei mother, and wanted to learn more. In his current job at Dell Computers, he was able to use what he learned. Wing Leung (1984-85) from Cal State L.A. recalled, “My parents were very upset I went to Japan. My mom was actually was one of the villagers that ran away from the Japanese army during World War II.” However, he enjoyed his experience, feeling that “I was able to bridge two worlds,” and last year attended a 30-year reunion on the Waseda campus. Also at the gathering were 1982-83 alums Jim Gottleib, John Iino, Judy Miyashita, Ken Nishida, Jennie Shikashio, Yuki Okada Woo, Marlene Yamane-Chan, Emile Yanagi and Scott Konishi; 1975-76 alums Linda Inouye and Joe Parker; and Fred Fujioka (1970-71). In addition to lunch, the get-together included a video presentation, anecdotes from alumni, and the singing of the Waseda fight song. Although there are no solid plans yet, it was generally agreed that there should be another gathering. J.K. Yamamoto was at the Kokusaibu from 1979-80 and assisted the WaKAmono planning committee.